These machines bring the benefits of technology to almost every aspect of cooking. From healthy fat-free breakfasts and beautifully succulent main dishes, through to finishing and regeneration, the combi-oven will produce perfect results with the minimum of fuss. The steam combi-oven can take the place of roasting, frying, grilling, and other cooking styles, while maintaining bulk and therefore saving money through portion control. This feature is stressed in the marketing of these models, which can be shown to pay for themselves very quickly with regular use. Another strong suit of the combi is the ability to batch cook and regenerate from chilled later, which of course is ideal for banqueting. 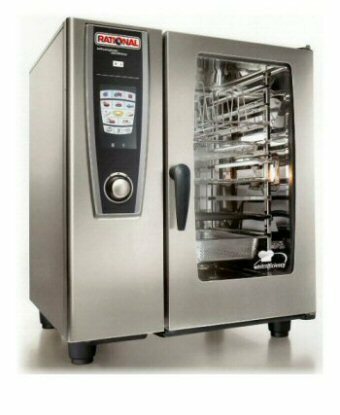 If the combi is king of the kitchen, then Rational is king of the combis. These machines are imported from Germany by two UK-based catering equipment companies, Rational UK and Lincat, who market them under their Opus brand name. We also offer the new combi-oven range by prestige catering equipment manufacturer Blue Seal. These units come in a range of sizes with either manual or digital controls, and won't break the bank. The size of combi-ovens is usually expressed in the number of 1/1 gastronorm dishes they will hold, described as grids. So a 10-grid combi will have runners for 10 1/1 gn dishes. A 1/1 gn dish measures 530 x 325mm. Note that the number of grids that will fit in the combi is dependent on their depth: the size rating above refers to dishes up to 65mm deep. We cannot publish Rational prices on our website, however we can always beat online-only sellers on price. Please call us for the best possible savings.